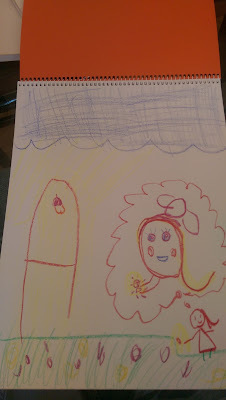 We began our morning by spreading a blanket on the floor, and lighting a special candle that Neviyah picked out herself. It has three wicks, so we decided one would be for her, one would be for me, and one would be for the earth. We recited a little morning poem, and then turned on the music to sing a Good Morning song to the world, and then some acting out songs to Five Little Monkeys, Head-Shoulder-Knees-Toes, and Skidimarink. We then moved to our first subject of the day, Language Arts. I told her "The Magic Spindle" folktale, and then she picked ORANGE for her Language Arts spiral notebook color. We talked about how the haystack from the story looked like a big "A," and how the little girl's head with her hair curling up in the back as she finds the magic spindle looks like a little "a." She then drew those two letters with the story in mind. After Language Arts, we moved on a little movement. We stretched, moved around, stood, bent, sat, laid down, jumped in the air, swayed to the left, swayed to the right, and shook out the wiggles. Now were were ready to begin Math! We are starting by exploring the four operations of math through storytelling. 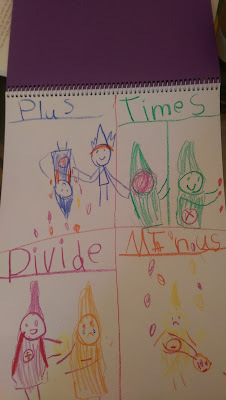 We began with an introduction to Plus, Minus, Multiple and Divide - four gnomes who collect diamonds for the King. 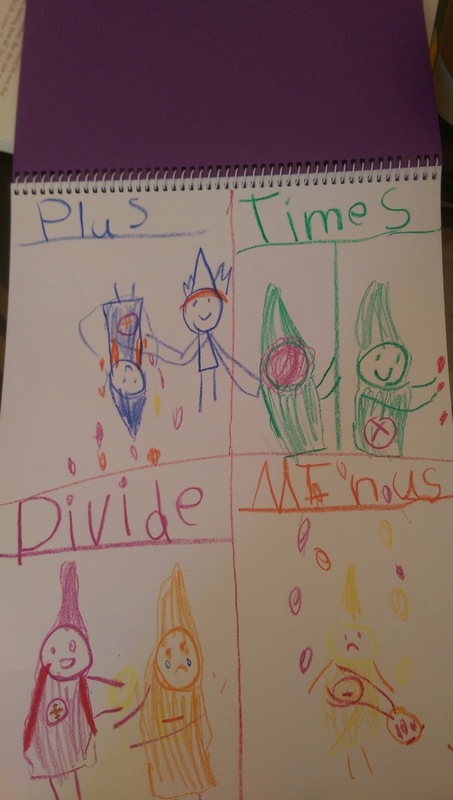 Plus is a heavy blue gnome who collect more than the required 12 jewels - his pockets are always full, and the King hangs him upside down to get the extra jewels to fall out of his pockets! Minus is a yellow gnome who has holes in his pockets and his bag, so he is always losing jewels! Times is a fast green gnome who loves to work. He gathers 12 jewels, brings them to the King, and then goes out again to get 12 more! Last is Divide. She is a caring and generous red gnome. When she notices that someone else doesn't have enough, she immediately gives them half of her jewels. Nevi then illustrated these four operations in her PURPLE math book. 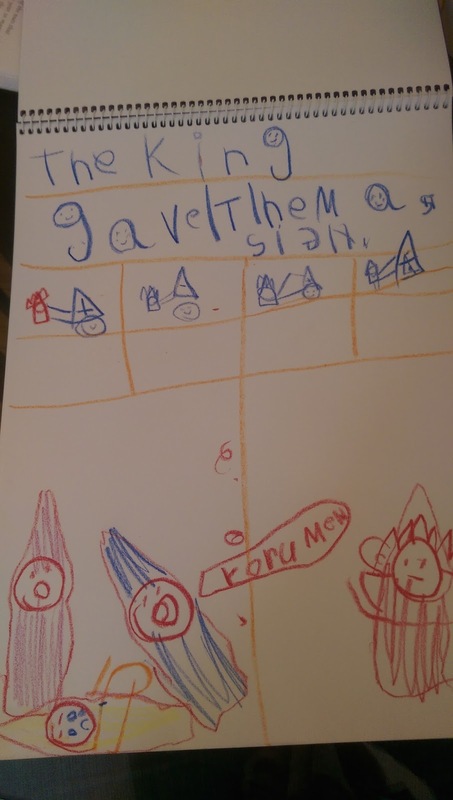 As the story went on, we learned that the four gnomes were fighting because their hats had fallen off, and they each didn't know which was theirs. The king gave them each a special sign so they would always know which hat was theirs. We left our story there, and will continue tomorrow. We took a break for snack, and enjoyed some Naf Naf Pita in the sun room. It was time to move on to Social Studies. 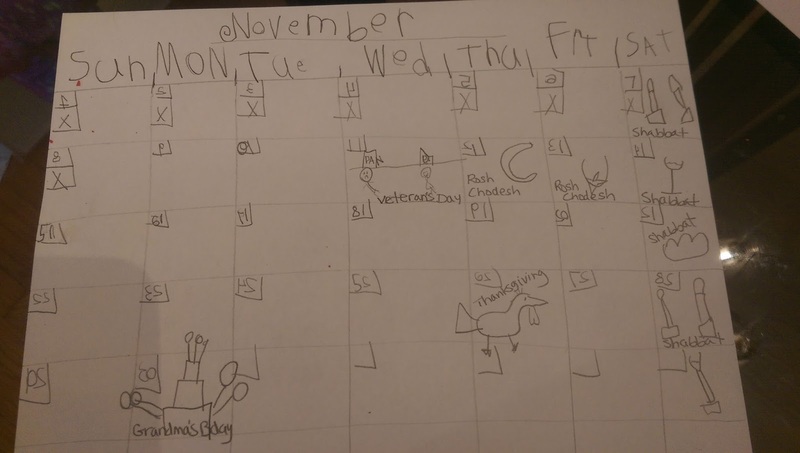 In Social Studies, Neviyah made a calendar, populated it with labels for the month, day of the week, and number of the week. Then she added holidays and birthdays. She made a special call to her Aunt Kerri to find out when Grandma's birthday is so that it could be noted. That was the core for the day. Tonight, we will add to our calendar with what the moon looks like, and also add anything else for the day that we witnessed - birds, season, colors outside...whatever she decides she would like to record.